After more than six months in prison, EPC missionary Andrew Brunson and his family are still waiting for a decision from the Turkish authorities on a resolution of his detention. His wife, Norine earlier this week, said she is very appreciative of the efforts of Vice President Pence, Secretary of State Tillerson, allies on Capitol Hill, the American Center for Law and Justice (ACLJ), and others who have prayed and advocated on behalf of Andrew. However, Andrew and Norine are convinced that President Trump is the only person in the U.S. who can get him out. While we have heard from reliable sources that the President is aware of Andrew’s situation, Norine has not yet heard from the President directly that he is working on Andrew’s release. Norine is asking for individuals to “do everything you possibly can” to engage the President. Since President Trump is active on Twitter, she would like to use Twitter to help focus his attention on freeing Andrew. Specifically she needs your help by engaging your Twitter followers in a campaign to get the President’s attention, using the following messages, that you can copy and tweet yourself. @realDonaldTrump great job getting #FreeAya Aya Hijazi back! Our #ForgottenAmericanInTurkey, Andrew Brunson, needs your help to come home! If you are not on Twitter, please consider joining this effort by going to www.twitter.com and clicking the “Sign Up” button. Thank you for your help on this, and for your continued prayers for Andrew and Norine. We update our Andrew Brunson resource page (www.epc.org/forgottenamericaninturkey) frequently as items come to our attention. Paul wrote this with the thought he was about to die, as one passing on the torch, with urgency for his friend to continue in the gospel, and with vision to see the gospel continue to multiply out. This has been a verse at the core of our staff's hearts all year and the core of our students leaders' hearts at our Summer Beach Project. We challenged all of our student leaders to know this verse. We challenged them to go before the Father daily to be strengthened by the grace that is in Christ Jesus and entrust what they've learned to those in their rooms this summer. This summer is not just another fun summer at the beach, although it has been enjoyable, but it's a pivotal moment. Mainly, because Jesus can be made much of and be glorified in it but also because young men and women could experience that fullness of joy from treasuring and following Christ that it refers too in Psalm 16. On our project specifically, there's about 120 students mainly from Troy and 20 of those students are from South Alabama. This is really cool because one, this is our first year at this campus and first summer at our SBP. Secondly, because 20 students was the goal we had been praying would go from South. We have 3 main trainings every week: Knowing God, Becoming Like Him, and Making Him Known. These trainings have played a vital role in helping our students really know where they stand spiritually before God and them seeing the call to make disciples by sharing their faith with others. 1. Pray that students would continue to give their life to following Christ this summer and that it would have impact on their peers in the fall and their families for many future generations. 3. Pray for the men on the team and involved with South Alabama's football program. This is where I will be spending a lot of time in the fall as well as the next few days. Ask the Lord to call out a few men to be spiritual leaders amongst their teammates. 4. In my last update I had an urgent request attempting to raise funds for some of our students. Your responses were very helpful and played a major key in two of our students, Rischard and Angela, going this summer. They are a young dating couple, going into their Sophomore year, and the Spirit has been building in them a desire for God's word, to know more about God and how they can glorify Him with their life. Rischard will be a Resident Assistant in the fall and has the desire to teach others about Jesus and the knowledge he learns at SBP. Just a few weeks ago he told us he understood what grace meant and how God's grace was really shown to Him through Jesus. Praise God for what he is already doing! Please be praying for their growth and that they would be future leaders on our campus. 5. Last, as I take time to hit the support trail again after SBP pray that the Lord would connect me to families and churches who want to partner with me to build the Kingdom. Below is a letter recently written by our International Director on our behalf. We are appreciative of the leaders around us and their desire for Lynette I to back in Asia. Leaders instill value in others by reminding them of the immeasurable grace we have in Jesus Christ. Leaders work to draw out of others their God given capacities and apply those to ministry. Leaders serve others so that together they might accomplish the task, the mission that God has given to them. James and Lynette Cottle are such leaders. They consistently seek to equip and release others into ministry. Two new ministry initiatives, which have recently been launched as a result of their leadership efforts, are a demonstration of their commitment to drawing others into ministry and leadership. Their own strong track record of experience and fruit in cross cultural ministry in Cambodia gives them a solid base from which to work in serving and leading others. I wish I had several more leaders like them. Such leaders develop and release more leaders into leadership, and launch more ministry projects to reach the unreached. However, James & Lynette are not able, at this time, to return to their leadership ministry location because of a lack of needed financial support. Their ministry is vital for the ongoing work and development of World Team. I would ask that you prayerfully consider joining their support team through your prayers and finances. A regular gift to their support needs will be multiplied through their lives in the lives of others. We need James and Lynette back in Asia to serve and lead our teams there! Thank you for your interest in the way God has called them to do. May He fill your hearts again today with the overwhelming assurance and wonder of His great love for you! Jesus made it clear that He's the Good Shepherd who searches for one lost sheep until He finds it. But Jesus never mentioned that He might show up in a purple Chevy Cavalier. Maybe that's why Tommy never saw the Savior coming. Or maybe he was blinded by his own despair. Tommy had decided that the rough road of life had taken one wrong turn too many. So the young high school student slipped a sharp knife into his jacket and headed out into the darkness with a plan. His rough road would end in a nearby vacant field. Tommy was almost to his final destination when the busted-up Cavalier sputtered up beside him. “Hey, Tommy!” his Young Life leader shattered the darkness with delight. “I've been looking all over for you! I want you to go to camp with me tomorrow!” It was an enthusiastic ambush, and Tommy was effectively disarmed. Tommy eventually climbed into the car with his Young Life leader and told him the whole heart-breaking story of his life. The next day, Tommy was on the bus to camp, though he had never been to club. Today, Tommy is following Jesus and training to be a leader. He wants other kids to know the Savior who can disarm them in their darkest hour with His love. Thank you for supporting Young Life. I'm deeply grateful for your partnership in this mission. Thank you for introducing kids to the Good Shepherd who sometimes drives a Chevy Cavalier. I guess it makes sense that the car was purple. It is, after all, the historic color worn by kings. The Lord makes firm the steps of the one(s) who delight in Him (Psalm 37:23). Since we arrived here eight months ago the Lord has set a clear path for us, and it has been very rewarding to follow it! We thought Governador Mangabeira was very different from what it is. It’s a small town. There are nearby towns on both sides, so it’s easy to gets things done. The people are very friendly and have accepted us as part of their community. It doesn’t matter that we’re the only U.S. citizens here; we are one of them. The Christmas and New Year holidays were uplifting for us. Some people had said that Christmas wouldn’t be celebrated by the town because of the economic situation, devaluation of the currency, and government problems. However, the local merchants’ association gave a car away. Anyone who spent 20 reais (the equivalent of $5.50) received a ticket for the drawing. Some stores and individuals decorated for Christmas. One of our members, Nanni, plans the order of worship each week. She included Advent themes and hymns. 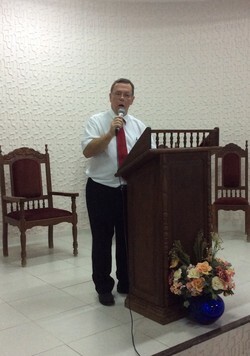 It was the first time in Brazil that we have celebrated Advent. Very typically, we had a worship service ending at midnight on Christmas Eve and a service to welcome in the New Year. 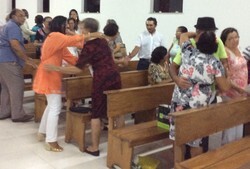 We worshipped as a family and greeted each other with hugs and wishes for a Happy New Year at the end of the service. We had a birthday party for Jesus one Sunday during Sunday School. It was for both the adults and the children. Usually the two groups do not spend time together. During the opening each Sunday the children and adults sit on different sides of the sanctuary and do not interact much. During the party, people could make decorations or bookmarkers of different symbols that stand for Christ, find different names for Jesus in the Bible, do activities to learn more about Jesus (do word searches or crossword puzzles, create puzzles or color pictures) or just visit. Happily everyone did at least one thing and a number of the adults were proud when they found the 15 hidden words or answered all the questions. We ended the party with snacks and birthday cake, naturally. During the holidays it was wonderfully evident that we are considered part of the families here. After worship on Christmas Eve we went to a typical Christmas dinner. Each person brought a present for the person whose name they had drawn; everyone played games and ate delicious food. We left “early” at 2 am. 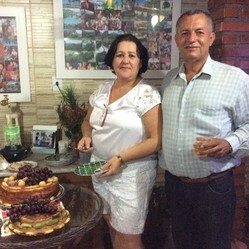 After worship on New Year’s Eve we celebrated the wedding anniversary of church friends and neighbors with delicious cake and snacks. The next day we were invited for a swim and a typical New Year’s Day luncheon. We had rice and beans, of course, and a variety of meats cooked together in a big pot. It’s so nice to be part of our friends’ everyday lives. Our presbytery, the Presbytery of Salvador, has only seven churches located in the state of Bahia, nearly as large as Texas. In January we attended the yearly weekend presbytery meeting. 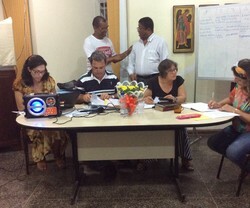 It was held in Salvador, the capital, in a convent where we could fellowship between and after the sessions. Four people from our church attended: an elder, a young man, and us. 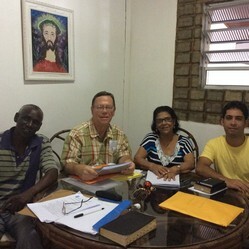 We have many friends and acquaintances in the presbytery, so we enjoy the meetings. Schools are on vacation from mid-December through the beginning of Lent. This year schools will return in mid-February. Dorothy has been teaching only her adult English class during this vacation and Gordon’s catechism class will continue in mid-January, so things have been lighter for us. It’s been rewarding this year to see church attendance increase and have new people feel welcome at the church. People have been able to meet their desires to learn more about the Bible and to fellowship with other Christians. Children’s Sunday School has been a challenge this year. As many of you know, when we arrived there was one class for children ages 5-15. A van picked up the children who live in a poorer neighborhood a distance from the church. Unfortunately many of the children showed no respect for the teachers, the pastor or any adults and came for the activities, snack and a chance to get away. In 2016 we have suspended the transportation. We are not going to reward bad behavior. Sunday School is continuing, so if the students are interested, they may come. The grandchildren of one member, up to six children, come when their uncle gives them a ride. They are well behaved and interested in learning new things. A couple of adults who are now attending bring their children, so we are “starting over.” Please pray for wisdom to hear and follow the Lord’s guidance as we develop a new program. The first Sundays were calm classes in which two children attended, learning new songs and new Bible stories. Both of us have found good physicians. After medical problems, Dorothy’s epilepsy is being controlled by much less medicine and Gordon’s diabetes is well controlled. Dorothy walks early in the morning with many other folks in town; she participates in a balance- and stability-enhancing program while Gordon goes to a fitness center. We are feeling good all around. Yes, there are problems and ups and downs, but we are finding our work very rewarding. We would be happy to pray for any needs you have. Please send us any prayer requests you have and join us in prayer for our work, especially the children’s Sunday School work. Thank you for your financial support in 2015. Please prayerfully continue or begin to support our work.